This was an incredibly fun group of bridesmaids and groomsmen to work with! And the entire wedding day was filled with moments like this. I love this image for the emotion and moment that it's capturing, I hope that it brings a Chip and Ansley joy for years and years to come. This image was photographed at Battery park in downtown Charleston. The bride and groom were married at Stella Maris Catholic Church on Sullivans Island and held their reception in the Cedar Room in Charleston, SC. The bride's dress is made by Essence of Australia, and a special thanks to coordinator Haley Kelly from A Charleston Bride. I absolutely adore the bridesmaids dresses, it's the first time in 13 years of business as a wedding photographer that I have ever seen a patterned dress instead of a solid color. It's definitely a dress the bridesmaids would wear again! The gorgeous flowers are provided by Greg Foster Florist of Spartanburg, SC. 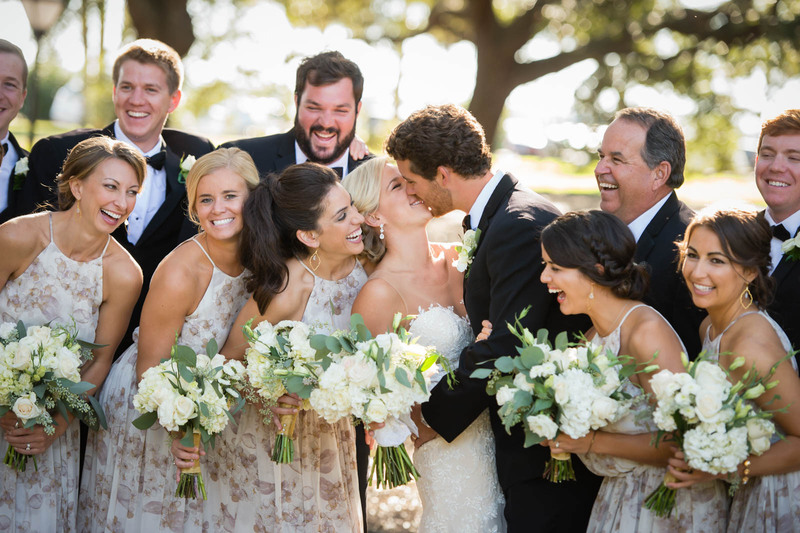 Although this wedding took place in the Lowcountry, the bride and groom were from upstate South Carolina and brought many of their wedding vendors down to the coast with them. We photographed the bride's brother's wedding several years ago, and that is how the couple found us. Most of our clients come from personal referrals and vendor/venue referrals...which is such a special way to find our clients. It instills a trust and comfort level when we work with them.